My grandfather passed away yesterday evening. It's okay, really, because living on this planet for 101 years is enough to make anybody tired. But still. 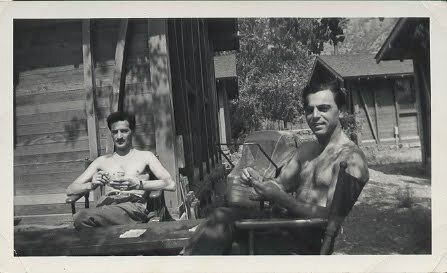 In loving memory of Elmer, April 1, 1910 to July 8, 2011. Father of Lynne and Donnie. Grandfather of Brad, Kathy, Adam, Bernard, Jill, and David. Great grandfather to Kimberly, Megan, Zach, Josh, Cassie, Rex, Jared, Leo, Nicholas, and Felix. And hey! My new layout even did a neat thing with the quote. So there we go. Wish I had something perfect to say. But I do not. My thoughts and prayers will be with you and your family. 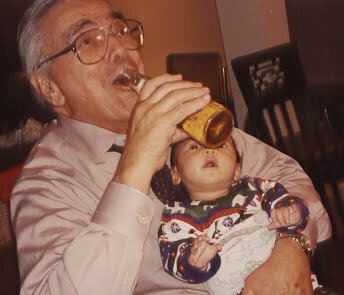 I don't recall right now what your faith/religion is, but I like to think that while there is an ending, your grandfather is also now celebrating a new beginning. Popo was absolutely one of a kind and I feel so fortunate to have met him. My deepest, most heartfelt condolences to you and your entire family. Jill, I'm so sorry for your loss! It's frustrating to feel ambivalent about your relationship with your grandfather, and at the same time need to mourn his passing. Death often churns up our emotions and there's nothing to do but ride it out. He was a very handsome man! How wonderful that he was able to hold your babies! I'd love to see more of your family's photos. I am sorry for your loss. He looks like he was a fun person. Jill, although 101 years is a good long while to walk this earth, it is still sad to me, and I'm sure to all of you to know that Elmer is no longer with us. Thanks for posting such lovely photos and I hope you all get a chance to wallow for a moment. I already told you how sorry I am for your loss. I love seeing his life in photos, it reminds me that the old man we look at now was once a young man with a whole life ahead of him. Makes me appreciate my time right now. A lovely tribute to your grandfather. Oh, what Beth said! I think putting together something like this is a positive and satisfying way to grieve and mark a passing. 101 is a great achievement. I wonder what his secret was? Thinking of your family today. Like your new template too. Sorry about everything. I'm sure it's not easy for you, even though he was 101. I feel lucky to have spent time with your Grandfather and Grandmother. I will never forget either of them. Wish I could come be with your family during this time. Hang in there! So sorry for your loss! These photos are a great way to remember a life well lived! 101 years is a long time but I'm still sorry for your loss. He was a handsome gentlemen. My thoughts and prayers are with your family. Jill, my heart and thoughts go out to you. Your grandfather had a long life, and you will eventually sort through the ambivalent feelings you have to remember the good memories. Do know that life continues and he is enjoying a wonderful family reunion right now. That is such a nice tribute of pictures. I am very sorry for your loss. 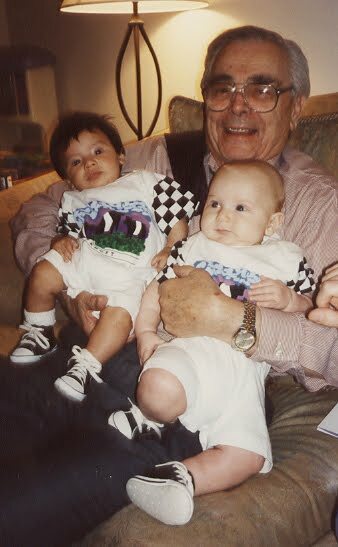 Pat & Maria - My brother made a comment about being the "keeper of the sweet and innocent childhood memories" of my grandfather, & I think the great grandkids have that too, and only that. I know there are a lot of great memories of him, and I have great memories of him. The other memories, they do just need some sorting though I suppose. And thank you. Sunshine & Shadows - Hey you're back! I hadn't checked your blog in awhile, because it had been so long since you'd updated I figured you had abandoned it. I'm glad you made it through your first year! And thank you. Thank you Debra. It was time and it really is good for him not to have to suffer when there was really no way for him to get well. But even so it is hard to say goodbye, even at 101. Thanks Beth and Arizaphale. Even though I've had those pictures for years, it still surprises me so much to remember that he was so young once. Thanks Bloggerfather. 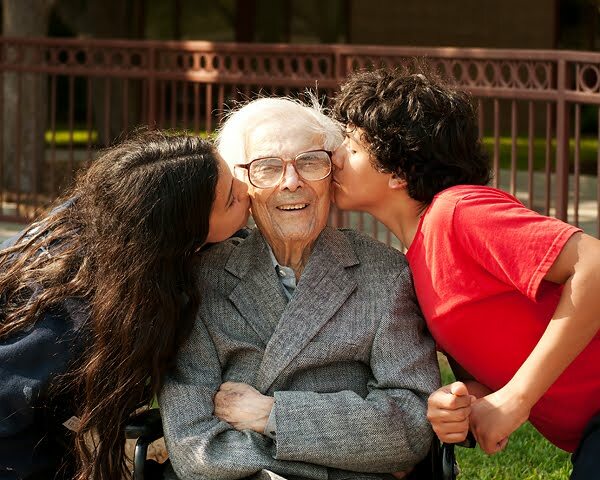 I didn't think it should be hard, because he was 101 and I'm so glad that he's not suffering. But it's still hard. It shouldn't be, but it is. Thank you Paula, I wish you could be here too. Thank you Yolanda, Staci, & Tracie. Jill, I'm sorry for your loss of your grandfather. I'll be thinking of you and your family. I'm really glad you were able to capture that photo of him this spring! 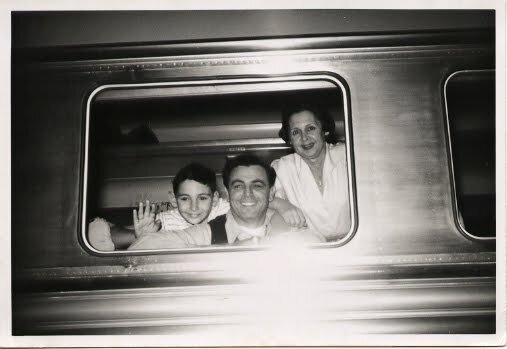 I love the black and whites you posted of him, especially the one on the train. I'm so sorry about your grandfather...but it does sound like he lived a good long life, and that is a blessing. Hugs. Wish I had something uplifting to say. Sorry to hear about your grandfather. Very nice memorial post to your Grandfather. Condolences on your loss. my condolences... i lost my grandfather, my best friend, 2 years ago this october. Jill,I'm a little behind on blogs - I am so sorry to read this. I immediately thought of the picture you had previously posted of him with your children and your concern it wasn't 'technically correct'. It was, in fact, perfect - both in design and timing. Family is a very complicated thing so it is not surprising to have mixed emotions. Thank you Amanda. Yes, I am incredibly grateful that I got that shot AND for your advice during his last few weeks. I wish you could have met him! Thank you Marlene - it surely was. Thank you Mark and Slyde. And yes, Slyde I remember you posting about your grandfather. Thank you Nicki & yes! At the time I took the photo I had really wanted to get him farther from the building and up into the park. But between him and his wheelchair, he was too heavy for me. It turned out to be a lucky thing though, because I'm so glad I got that shot! If I make it to 101, I think I will be ready to turn out the lights. Yeah, me too Bruce. I think I'll be well, well ready. At least I hope I am. My dad keeps saying, "No one wants to live to be 100 except a 99 year old." And thanks! I think I like it. It does do semi-too-ornate things to the quotes though. Oh Jill, I'm so sorry. I love the photos of him, such a nice tribute. Good thoughts my friend. wow. 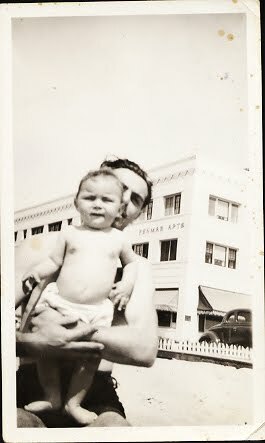 so i havent blogged in months, and my own grandfather passed away this morning, so i wrote a not funny post. then i poked around and saw yours. i'm so sorry. it doesn't matter if they've lived a long and good life, you always want a little more time- to hear the stories over and over again. Thanks Kerry & Disa, and I'm sorry Disa. It is hard.